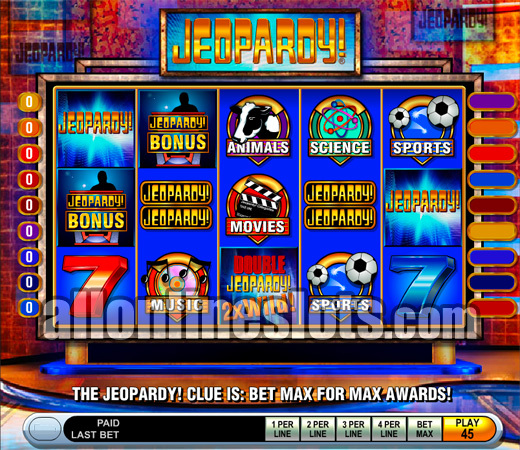 IGT Online Slots - Jeopardy! 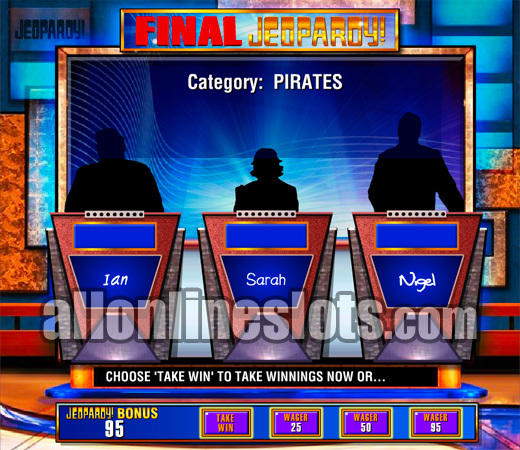 Jeopardy is an IGT slot game based on the hit gameshow and found online at Wagerworks casinos. 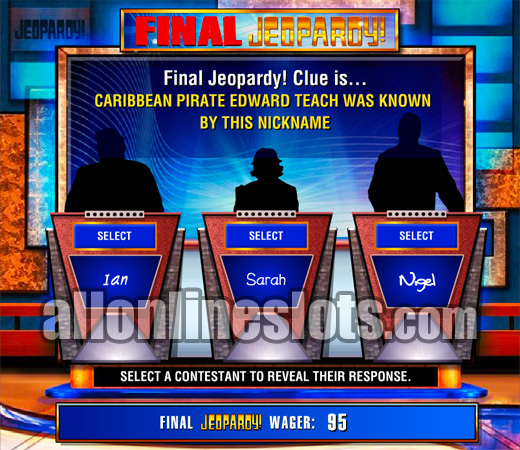 It has a big 25,000 coin jackpot as well as a great bonus game based on teh TV show. Max bet is 45 coins and coin sizes start at 0.05. The Jeopardy game show was an instant hit and this slot machine followed the same trend. It became an instant hit when it was released in Las Vegas. Now due to the fact that IGT owns Wagerworks you can enjoy the game for real money from the comfort of your own home. The theme for this game is really well done. not only do you have graphics directly from the TV show but you also have the same music and sounds. This adds to the whole experience and really makes this version identical the to the same game you would find on casino floors in Las Vegas. The game is a 5 reel, 9 line video slot with a maximum bet of 45 coins. It comes in coin sizes starting at just 5p so maximum bet at the lowest level is £2.25 per spin. If you want to have a shot at the 25,000 coin jackpot you need to play maximum bet as any bet lower will not win the top prize. 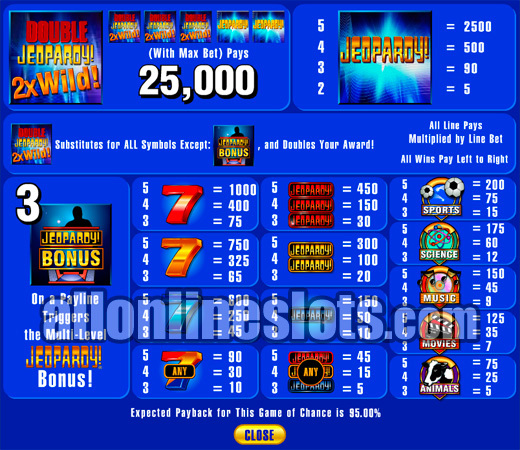 The 25,000 jackpot is won by getting three of the Double Jeopardy symbols and two Jeopardy symbols on any active line. The Double Jeopardy symbols are wild and substitute for everything but the Jeopardy Bonus symbols. Second highest pay is 12,500 coins for five Jeopardy symbols. Also on the reels are three other symbol types. These are 7's, Bars and Categories. One interesting feature is the fact that you get a win for any combination of sevens or bars. This is quite unusual on a video slot. These lower pays range from 1,000 coins to 75 coins. You get to pick one square at a time to reveal your bonus win. You get to keep picking until you uncover a Final Jeopardy square. This ends the bonus round and moves you on to the final stage where you can try to increase your win. Overall, the Jeopardy slot machine is a great addition to Wagerworks casinos. If you are not in the USA then we highly recommend you check it out.